I thought that I would use Garett's foot infection to tell you about something I would NEVER be without in my house...Bentonite Clay. "Its highest power lies in the ability to absorb toxins, impurities, heavy metals and other internal contaminants. 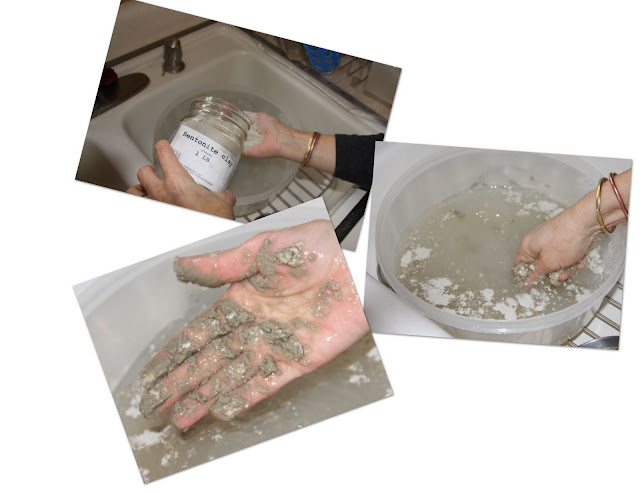 Bentonite clay's structure assists it in attracting and soaking up poisons on its exterior wall and then slowly drawing them into the interior center of the clay where they are held in a sort of repository. To state it another way, Bentonite is swelling clay. When it becomes mixed with water it rapidly swells open like a highly porous sponge. From here the toxins are drawn into the sponge through electrical attraction and once there, they are bound." Because of Bentonite's ability to draw out infection, I have been putting it into the hot water I soak Garett's foot in. The red, line that was going up Garett's leg is already better today, and that skin infection was part of what was hurting him so bad. Yesterday, I soaked his foot every few hours. Today I will probably only need to do this three times. We have used this clay as a mud pack for acne, bug bites, we have a family member that uses it for boils or other skin infections. It is also wonderful as an internal cleanse. You can find out more about it at Bulk Herb Store. Interesting Shonni. We use that clay to bathe our autistic daughter in to help remove heavy metals from her body. I guess I never thought about using it in other ways but that does make sense. Thanks for sharing. I will be keeping this in mind for future uses. We have it always in the house!